Norway came first in the United Nations’ World Happiness Report, 2017. So, what is it that makes the Fjordland natives so happy? Well, we were game to find out! We flew from Zürich to Ålesund via Copenhagen with SAS. When booking the flights, Kurt discovered that SAS plus was the cheapest way to bring the bikes and gear, as bikes are considered regular luggage rather than sports equipment on SAS. Cube meal fit for a king! Having booked the flights four months in advance, we monitored the weather in Ålesund from time to time. For the first two months, it snowed, and the second two it rained. So, we were mega impressed with the glorious sunshine that greeted us on arrival. Norway’s powers of engineering became apparent 15km after leaving the airport. Two undersea tunnels separated us from downtown – tunnels that forbade cyclists. However, Ålesund’s efficient bus system had no problem coping with the likes of us! The town, built on four islands, is today a wonderful example of art déco, having been rebuilt after a devastating fire in 1904. 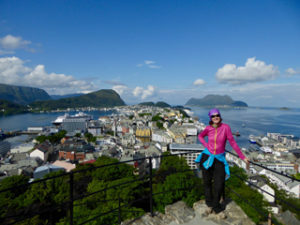 Being in the area, we headed south first to check out two of Norway’s top tourist attractions. Ferries and bridges helped us along the way as we explored a number of minor fjords in atmospheric weather conditions. No stopping for the next 2km. The Geirangerfjord is a UNESCO world heritage site renowned for its historical and geographical significance. 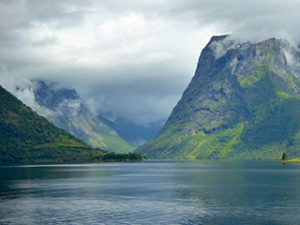 This perfect fjord with steep mountains on either side can only be explored by boat. Some of the vacated farmhouses precariously perched high on the slopes could only be reached by ladder, which was handy when the tax man was on his rounds! The limited access to this natural wonder did not mean we were alone. Passengers from four cruise ships anchored at Geiranger all had to be shuttled up the serpentines to the viewpoint, just as we were sweating up the 10% incline. This did not enhance our appreciation of what supposedly is Norway’s pride and joy. We approached the second highlight from the less spectacular side. On top of Trollstiegen, we were surrounded by a circus of buses, cars, camper vans and competitors of a mega mountain triathlon. From the spectacular viewing platform, we could enjoy an unhindered view of the 11 hairpin bends, complete with chaotic traffic jams. We took it all in and by the time we hit the famous road, we had the place to ourselves. Traffic jam – the order of the day! Converted trees Those sights ticked off, we were then ready for our northerly ascent. Pleasant farmland, colourful wooden churches, wild lupins and floxgloves made for enjoyable cycling. Lake or fjord? Hard to tell at high tide! On reaching another undersea tunnel outside Molde, we waited at the bus stop for a transfer. You could be waiting a long time on the weekend with minimal bus services, unless of course, you are spotted by Filip, aka the Smart Arctic Fox, who did a detour in the van to shuttle us through. Incidentally, if you ever want to go on a fishing trip, this is your man! Tak Filip! 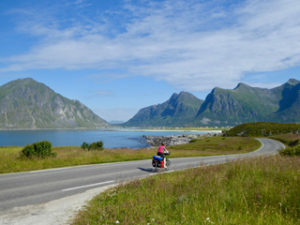 The Atlantic coastal route Norway boasts 15 national tourist routes, one of them being the Atlantic coastal route. This hopscotch of bridges linking islands and skerries between Molde and Kristiansund is quite spectacular, although a lot tamer than the Irish wild Atlantic way! Cycling through Trondheim, Norway’s third biggest city, we were waylaid by a local reporter. He obviously supplemented the short interview with a thorough read of our website, but we’re not sure where the Lebanon trip came out of. Perhaps we should put it on our to-do list! You can read the article here. Incidentally, a Norwegian mile is 10km. Trondheim boasts Europe’s most northerly Gothic cathedral; it replicates an English design quite reminiscent of Wells cathedral. On a culinary note, we can highly recommend the bacalao and reindeer dishes at the Baklandet Skydsstation restaurant. To encourage residents in one of the higher suburbs to commute by bicycle, Trondheim council came up with a unique idea: a bicycle lift. While the right foot is placed on a moving footplate, the right leg should be kept straight and at a 45° angle. The bike is ideally 10cm from and parallel to the lift rail. In the meantime, the poor cyclist does his best to keep his balance! The result is a tourist attraction that no one seems to master. It would be a whole lot quicker to cycle! Dinner at the campground After a couple of wet days on quiet roads along the fjords, the weather got better, but the traffic intensified once we hit Route 17. That is when a couple of tourist brochures selling Leka Island convinced us of its merits. All game for the bike! Letterbox & wheeley bin shelter! A unique geological anomaly in Leka is the American serpentine and olivine rock that was revealed after the last ice age on the western side of the island. Resembling rock constellations in California, Oman and Cyprus, this yellow-red rock is uncharacteristic in this part of the world. Deer sighting Frequent road signs reminding us of the presence of elks (moose) never ceased to excite Darina. Alas, the nearest we got to an elk was a couple of shy red deer on Leka and a delicious salted elk roast on the dinner table! Prehistoric cave paintings depicting 21 stick men and non-men were discovered in 1912, along with tools and human and animal bones. It is thought that they date back to the Stone Age. The monochromatic images are painted in red and appear to be dancing. There are still many questions about the motive behind the paintings, but rituals and sacrifices are possibilities. The caves can be visited with a guided tour twice a week. The eagle story Leka has a fascinating story of a three-and-a-half-year-old child who went missing in 1932. After a full day’s search by all the villagers, the little girl was found unscathed on a high ledge up a steep cliff. The only explanation was that an eagle had deposited her, as no child this age would ever make it up there. The ledge is now clearly marked with a red spot for all to marvel. More recent excitement in Leka revolves around a young cross-country skier of Irish extraction hoping to represent the Emerald Isle in the next Winter Olympics. Keep an eye out for Thomas Maloney Westgaard in PyeongChang, South Korea, 2018! Cycle route 1 Back on the mainland, we followed the coastal main drag (Route 17) to Brønnøysund with everything from glorious sunshine to short downpours. From time to time, there was a sign reminding us that we were on the cycle route number 1. Do trolls eat ice cream? It seems that some troll, in pursuit of a trollgirl (Leka was her name), shot an arrow in her direction in true cupid style. Meanwhile, troll number 2 threw his hat to save the girl. Well, the hat ended up with a hole in it, the sun rose and everything turned to stone. We now have the story of Torghatten and Leka! Admittedly very economical for a myth, but then there is the saga of a few extended families that now dot the coast. We’ll skip that! On noticing this truck with mega front bumpers, Darina’s hopes of encountering an elk were lifted again and her elk spotting continued with renewed intensity! Could there be an elk out there? The centre of Norway In Brønnøysund, instead of a campground, we found a fast ferry to Vega Island departing in 20 minutes. Well, after making up our minds we still had 19 minutes to take a picture in front of the sign marking Norway’s centre point – and enjoy the best salty caramel ice cream ever! This stretch from Leka to Bodø (the Helgeland coast) is where the Norwegians go on holidays. Mainly because it’s quite spectacular and not as overrun as the Lofoten Islands further north. The friendly locals on the boat to Vega were quick to point out all the sights we had to see in the area. Actually, an exhibition by local photographer, Hanne Pernille Andersen, gives us a light-hearted insight into these happy Europeans! Once landed on Vega, as the boat pulled away and we examined the map in the harbour, a lady approached us saying: “You’re way out here!” By then, there wasn’t another soul in sight, but 6,500 islands, islets and reefs waiting to be explored. Actually, the Vega Archipelago is a UNESCO world heritage site recognised for its sustainable fishing, farming and eider down harvesting practices. The local ladies provide safe nesting options for the eider ducks, and only when the birds have left their nests, is the down collected. With eider down being the lightest and warmest down around, duvets from here go at the premium price of about €4,000. Perfect picnic spot On the mainland again, the road brought us past the Seven Sisters (you guessed right, they are part of the myth above) to Sandnessjøen. We arrived just in time for a spot of shopping before hopping on the fast ferry to Lovund. We didn’t even have time to take a pic of a significant sign, but then again, there mightn’t have been one! 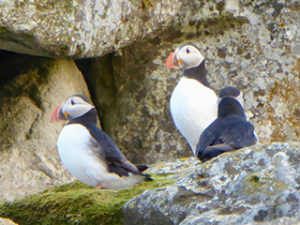 Lovund is famous for its huge puffin colony, so after having pitched the tent and cooked our dinner, we climbed the hill to observe these funny little creatures. We couldn’t get as close as back in Iceland, but it was enough for a couple of cute pictures and a lot of blurred ones. Bloody fidgets these birds! WWII German fortification The next ferry brought us to Stokkvågen on the mainland. From here it was a coast hugging road, leading past a WWII German fortification (now complete with museum), along the very scenic Aldersund, and on to Tonnes. In Tonnes, we had a wonderful campground right at the beach. When the express boat to Bodø was cancelled the next morning, we went straight back to pitch the tent again for another day in paradise! Then, in true Norwegian style, we rented a boat, bought a simple fishing contraption and sourced dinner. If Kurt is any indication, fishing could well be a contributing factor to the Norwegians’ happiness! Summer on the Arctic Circle! Svartisen Glacier The next day as we crossed the Arctic Circle, we had local Sven point out glaciers, and swing stories about his time in the army, on boats and out hunting, fishing and hiking. Never a dull moment! It’s clear that the Norwegians work to live and spend as much free time as possible in the great outdoors. They have their work-life balance sorted, and we could all learn a thing or two from them! Next stop was the Lofoten Islands. We were warned by the Norwegians further south about how crowded it would be, but in all fairness, it was a far cry from the Mediterranean norm. With their magnificent sheer cliffs, picture-postcard villages on stilts and white-sand beaches, it’s no wonder the Lofoten are so popular! 1,780m long under-sea tunnel It did come with a mini-challenge: Nappstraumtunnelen, a tunnel under the sea. We were warned to be careful, maybe a bit too much. It’s a steep down and a steep up. It’s cold, loud and doesn’t smell great, but there is an elevated sidewalk to cycle on or to push if cycling is too scary! At the Viking museum in Borg, we learned that for the Vikings a raid was like a holiday because life at home was such hard work! It’s no wonder that so many settled along their trading routes, bartering stockfish (dried cod) for all the luxuries the fish would buy, and raiding for the rest. A quiet threat that lifted the exchange rate of the fish for sure! Vågan Our ride on the Vesterålen island group led us along quiet roads and through beautiful scenery. We could call it exceptional too, but then we had so many exceptional rides that it wasn’t exceptional anymore. This is not us getting a tad blasé about it, just an attempt not to overuse the word exceptional. Ooops – guess we just did! Norway’s Queen Sonja (80 years of age) is a great walker. The Irish would love her! So many places have a Queen’s Way, named after her hike there, we wondered if she ever sleeps. We did the one that follows the coast from Stø to Nyksund and then up a few ridges back to Stø. A full day’s hike. With clouds and fog wafting around the path, and the sun trying to break through, we found that it had a myth-inducing quality. We’ll spare you the ones we came up with! Cloud berries We gorged on cloud berries, a speciality in this area, often frozen and served for dessert on Christmas Eve. They look like large orange raspberries and have a delicate vanilla flavour. Mmmmmmn. The ride to Andøya was another trip highlight. The icing on the cake was the camping spot at the end of the day. Bent sent us in the right direction and supplied us with enough water to cook dinner & breakfast. We even hopped into the very refreshing Arctic water, surfacing at record speed! Coastal fog blocked the views the following day but lifted just as we were passing a beautiful white-sand beach! In Nordmela we were invited to represent Ireland in the stockfish- throwing competition. That we did … and it was mighty crack altogether! Short before Andenes, we visited the Andøya Space Center, which we can highly recommend. 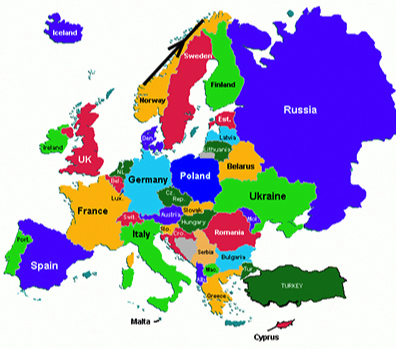 Did you know that Norway was the fourth nation to send a rocket into space? This, and other interesting facts mainly about the Northern Lights, was what we learned there. Senja Senja was something we had been looking forward to as it is often rated as one of Norway’s undiscovered gems. But apart from a blue sky in the first fjord, and a beautiful rainbow between the showers, coastal fog limited views of the jagged peaks. So we took the ferry to Kvaløya and enjoyed blue skies there. … but all that emerged, much to Darina’s dismay, was a pet reindeer in someone’s front garden! Adventurous camp spot! Evening approaching, a bus driver pointed out a fisherman’s cabin with a grassy patch on the water’s edge, just big enough for our tent. We enjoyed dinner in the shelter while watching a fly fisherman at work. All was well until Darina woke at 3am to the sound of lapping waves way too close for comfort. The sea, at least 50m out when we went to bed, was now 50cm away and only 10cm below our groundsheet. Luckily, that was at high tide! Whew! The rest of the way to Tromsø was uneventful, and we spent our last couple of days sightseeing and chatting to other cyclists. Throughout the trip, it never really got dark. The sun generally set around 11pm and rose again a couple of hours later. This removed the stress of having to get anywhere before dark, and we could have even cycled through the night. A Norwegian sports car! So, what is it that makes the Norwegians so happy? Well, they are an active crowd who make the most of their natural surroundings. A sports car in Norway is one with two sea kayaks on the roof and two bicycles on the back. Hiking, biking, kayaking and fishing are the order of the day. They work a 35-hour week and clock out promptly to spend time with their families. Getting away from the stresses of modern life by spending weekends/holidays in a hytta (cabin) without electricity or running water is typical. Ideally, the hytta should not be accessible by road! This concept of enjoying the present in a cosy, relaxed atmosphere is known as hygge and is engrained in Norwegian culture. Garden decoration: Norwegians have a real sense of humour! Photo by Hanne Pernille Andersen The unemployment rate is as low as 4%, health and education are pretty much free and the Norwegian state fund is the world’s largest individual wealth fund, hovering around €750 billion. Financial worries are for others! Even the dogs go on holidays! A trip to Norway doesn’t come for free. A tent and two adults in a campground costs around €16, cabin prices start at €50 unless pre-booked, and simple hotel rooms average around €100. A meal for two can easily hit the €100 mark once alcoholic drinks have been added. With beers at €10 a pop, Kurt was certainly a happy man whenever he had enough spare change! Wild camping on the Lofoten To soften the blow, in the Outdoor Recreation Act of 1957, Norway introduced All Man’s Right. This gives everyone the right to camp for free on uncultivated land for up to two nights and longer in more remote areas. As long as you are 150m from the nearest house, you won’t be disturbing anyone. The locals embrace this, and on many occasions they reassured us that you don’t need a shower every day! There are a number of local specialities that we really enjoyed. Waffles, reindeer, moose, lamb, stockfish, mussels and, of course, salmon. Picnics were a treat and our old faithful camping stove held its own. Shops were never far away, so we didn’t have to cart around expedition-like supplies. The Norwegian flag In conclusion, Norway is WOW personified! The people, the drivers, the scenery and the terrain make for spectacular cycling. So, if you don’t mind temperatures between 15 and 25°C, with the occasional shower thrown in for good measure, this is the place for you. By camping wild and going without a beer, you could even do it on a very tight budget! And you get to rub shoulders with the happiest people in the world!